This is week 7 of a weekly art journal based on guides provided by Dale Anne Potter. All pages of this art journal are based on a tag created from card stock. This weeks challenge was What do you love? I started this week’s art journal tag was once again started by applying gesso and a wash of water colour. The gesso had been textured by stamping into the gesso while wet. This one had a fair amount of gesso so there is a lot of texture. Too bad I covered most of it up! The paper lace heart has been in my stash for years, waiting for the right occasion for me to use it. As I made this tag while working during a ‘play day’ session with friends, I ended up with a donation of a number of embossed hearts to complement my solitary one! Thanks Jan. Hand-cut felt letters, a rub with a gold stamp pad and some of Jan’s ribbon completed the tag. 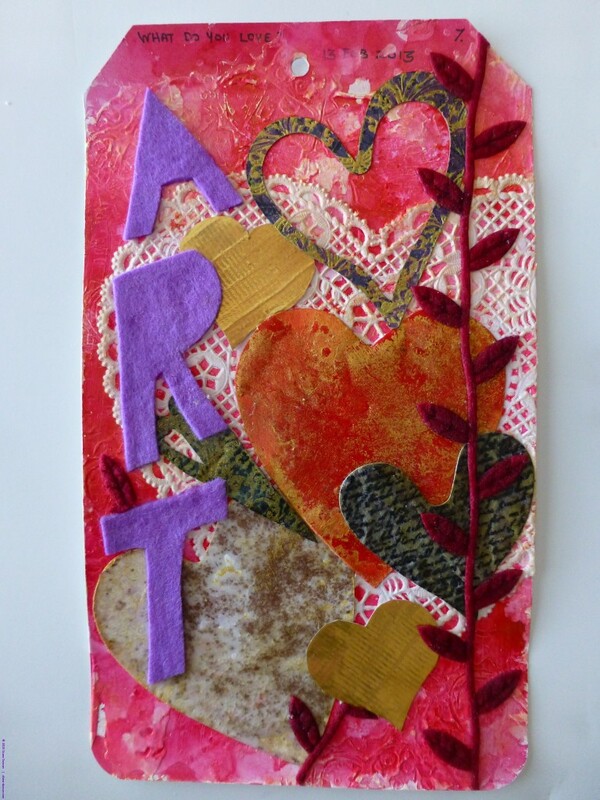 This art journal tag represents Valentine week – a time to pause and appreciate those special people in your life. Although the tag itself focuses on my love of ‘art’, it is really my reminder of how much I appreciate my family and friends. It inspired me to create the mini-grandpa-brag-book for my husband for valentines day. It can be found on another page of this portfolio and in my blog.